Manama, Feb. 14 (BNA): Ministry of Foreign Affairs (MoFA)'s Undersecretary for International Affairs Shaikh Abdullah bin Ahmed Al Khalifa has chaired the preparatory meeting of the Ioint Working Group between the Kingdom of Bahrain and the United Kingdom to discuss the issues that will be presented during the next Ministerial Meeting of the Joint Working Group. 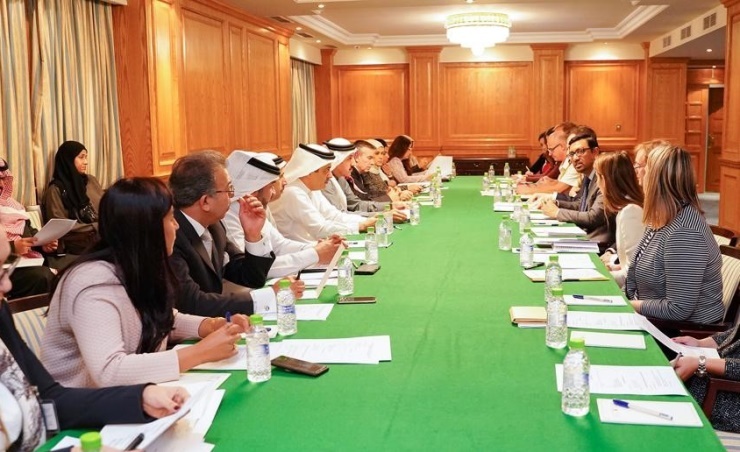 The 11th ministerial meeting will be held in the Ministry of Foreign Affairs in Bahrain on February 20, 2019, under the chairmanship of Foreign Affairs Minister Shaikh Khalid bin Ahmed bin Mohammed Al Khalifa, and from the British side Minister of State for the Middle East at the Foreign and Commonwealth Office, Alistair Burt. The preparatory meeting discussed the issues of mutual interest, which are to be discussed, particularly: bilateral issues and means of enhancing them between the two countries, especially in the economic, investment and reform fields, and enhancing relations in the education, science, innovation and scientific research sectors, in addition to energy and transportation, environment and water treatment. The meeting also reviewed regional issues and regional developments, as well as cooperation in combating extremism and terrorism. Dr. Shaikh Abdullah stressed the importance of strengthening the strong relations of friendship and the close historic alliance between the Kingdom of Bahrain and the United Kingdom. He expressed his appreciation and satisfaction for the mutual desire to open new horizons for bilateral cooperation, thus enhancing the growing partnership between the two countries. Noting the responsible and active role of the United Kingdom in the stability of the Arabian Gulf region, as well as positive cooperation in fighting terrorism in all its forms and manifestations. MoFA Undersecretary for International Affairs highlighted the promising economic and investment opportunities between the two Kingdoms, adding that the Bahrain Economic Vision 2030 has translated its objectives to divers sources of income and attract specific investments under the infrastructure and organizational technology and financial services based on Bahrain's advanced position as a regional hub for logistics and entrepreneurship. Dr. Shaikh Abdullah said that the comprehensive reforms and achievements of the Kingdom of Bahrain in various fields came as a result of the reform approach of His Majesty King Hamad bin Isa Al Khalifa, and representing a regional model for reform, sustainable development, and human rights in a broad sense. The meeting of the Joint Working Group between the two friendly countries is held twice a year according to an agreement signed in November 2012. It discusses developments and means of strengthening bilateral cooperation in various fields.